Just call us at 812-550-1434 or 812-304-0243 or email us at studio136@paintingwithatwist.com however read on for further party information. You get to choose from ANY of over 6000 paintings - some are 2 hour and some are 3 hour classes. Choose your own Date, Time and Painting. No set up, no clean up - just show up! Feel free to bring in Food and non alcoholic beverages. Please advise your guests to arrive at least 15 mins. early as we will start PROMPTLY at the time chosen. This will allow time to mingle, drink and just relax before the fun begins! Kids parties ages 6-12 may be booked 10am-6pm Mon-Fri and 10-4pm Sat-Sun. Minimum age to paint at our studio is 6. The minimum number of guests required for a private party is 8. Our private room capacity is 24, but if the event gets bigger we can move it to the main room with capacity of 48. If you are in need of a larger capacity, please notify us of this need immediately. Private parties can be booked either for a two-hour session at $35.00 per person or a three-hour session at $45.00 per person. 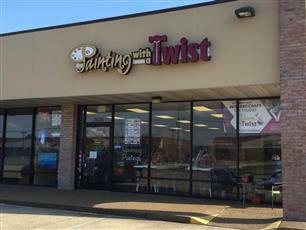 Children’s parties, age 7-12, can be booked at $25.00 per person for a two-hour session if the painting selection is chosen from PWAT’s 1.5 hour (12 and under) category. Your guests may also pay in advance, as they arrive or you can pay as a group. Acceptable forms of payment are all major credit cards or cash (we do not accept checks). If the host has a minimum of 15 guests (16 including the host), the host will receive a complimentary gift certificate in the amount of the value of the session (ie: $25, $35 or $45). The gift certificate can be used as payment for the private party or a future class. A $105.00 non-refundable deposit is required to reserve a Private Party. This deposit may be applied to the cost of the Party or returned back to your credit card once your party has checked in with the accurate guest count. If the minimum requirement is not met for the party through attendance, the host/hostess credit card will be charged the balance to meet the minimum. Otherwise, we reserve the right to open the class up to the public if the minimum required is not met 5 days prior to the party date. Kids 2hr parties are discounted at $25/person. Art selection must be from PWAT Kid's 1.5hr category. Minimum age is 6 to paint. Cupcakes and Cookies will be set up before you arrive for your party! $225 for 8 painters including the birthday person.